As we embark on these three holy days of Jesus’ betrayal, death & resurrection, we participate in God’s compassion in the most literal sense, “suffering with” Jesus and those who loved him. 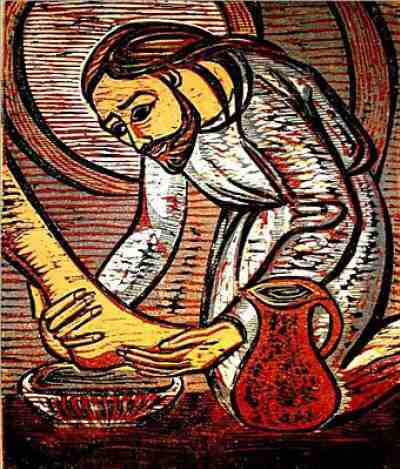 Tonight, as we join Jesus and his disciples on the evening before his death, we note the tenderness with which Jesus washes our feet and the intimate generosity of that last supper. Help us, Lord, to treat each other tenderly and generously. Later, in the garden, we stand in solidarity with all those “who wake, or watch, or weep this night”. We suffer with both the betrayed and the betrayer. Forgive us, Lord, of our betrayals, even as we forgive those who betray us. Tomorrow, we mourn. As we experience the pain of parting, of absence, may we remember those for whom this is not a spiritual exercise but a lived reality. We pray for those experiencing grief and loss. And finally, as we reach the astonishing joy of the resurrection, we remember that participating in God’s compassion means sharing not just pain, but also hope, because Christ’s resurrection is a promise that “more can be mended than we know”1. Jesus, by your dying we are born to new life: by your anguish and labour we come forth in joy. Despair turns to hope through your sweet goodness: through your gentleness we find comfort in fear. Your warmth gives life to the dead: your touch makes sinners righteous. In your compassion, bring grace and forgiveness: for the beauty of heaven may your love prepare us. Jessica Stone is the Ministry Coordinator for the Church's Ministry of Healing: Ireland.